Grown for the leaves, Sorrel is not widely used in kitchens in Australia, it is perhaps an underrated plant in many peoples eyes. It was once used widely in soups and stews, however it was also seen as a bit of a weed. Used in many recipes and it is said to go well with eggs as well as fish. 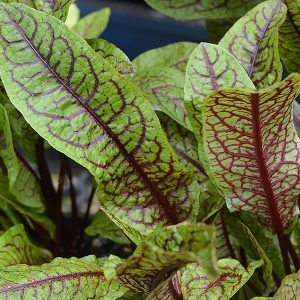 Sorrel does taste a little acidic or ‘Tart’, in salads it is best with a dressing that has some sweetness. The younger the leaves the more mild the taste will be as the oxalic acid content is less than in older leaves. If you are not keen on the taste, in most recipes you can substitute spinach. It is worth remembering that a few varieties of Sorrel are available, the French version (R scutatus) has a milder flavour than (R. acetosa). The red veined Rumex sanguineus is also very popular. Sorrel is a useful herb that will grow to over .5m with deep roots. Try a cool shaded part of the garden to stop sorrel from becoming bitter and ‘bolting’. Plant seeds in spring. The problem with this plant is that it contains lots of oxalic acid, and this means that it should not be eaten in large quantities. When used in cooking it more used as flavouring rather than the main ingredient. Sow seeds in spring after any danger of frosts has passed. Choose a humus rich soil with some moisture, a slightly acidic soil is best. Water well through establishment and through summer. Two or three plants are usually enough for most households.